Basement remodeling is one of the best ways to remodel your basement if you have a mother-in-law or teenager that need their own space. 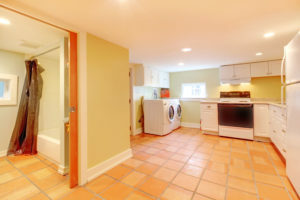 If you’re interested in exploring the possibilities of basement remodeling read on. Here are a few great ideas and reasons for including a mother-in-law suite in your basement remodeling plans. We’ve all heard the jokes about the pasty white geek still living in their parents’ basement playing video games and sporting a dungeon tan, but that isn’t where we’re going today. We want to talk about the actual functionality of the basement apartment. Many homeowners visualize a dark, dank existence for anyone living in the basement apartment when the truth is much different. Codes and Permits – All of the legal stuff has to be followed to the letter when transforming your home. We may need to get a few project-specific permits including electrical and plumbing, along with the normal building permits. We can handle all of the paperwork for you, because it can be a real headache. Windows – All basements have to have an escape route, and most basements are situated in such a way that they can have windows and doors. The windows may be egress windows with a nice window well, but they’re still a lovely way to add natural light to the basement. Add a nice set of French doors that open onto a patio, and you have a great start. Proper Use of Space – There’s absolutely no reason that you can’t maintain ownership of part of your basement for storage purposes or even a family room while still providing plenty of living space for your parent or other tenant. A studio apartment is extremely easy, and a one-bedroom apartment is just as simple to create. More than an In-Law Suite – We all know that our parents, unfortunately, will not be around forever and that the suite will become vacant at some point. This is when the apartment can become home to your own adult child or even rented to someone local to help supplement your income. You could also keep it vacant for the occasional visitor or overnight guest. Many homeowners are using online sites like AirBnB to rent small apartments or even guest rooms to guests who book through the website. Tri-Lite Builders is home to some of the best builders in the greater Phoenix area. We truly enjoy helping homeowners transform their homes into something spectacular. Here are several examples of our work if you would like to view our handiwork before you give us a call at 480-895-3442 to get started on your basement remodeling project.